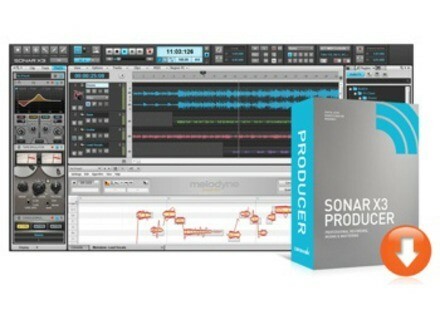 As announced, Cakewalk launched the X3 version of its SONAR DAW, available in three Studio, Producer and Standard editions. Most of the new features in this new version has already been detailed last week in this news. Cakewalk also announced that all SONAR X3 editions now offer an unlimited number of tracks, wether they are audio, MIDI, effects and sends, thanks to the 64-bit audio engine power. 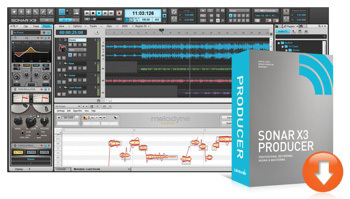 The ARA engine for Melodyne is available in Producer and Studio editions only, as well as certain of the effects announced last week. The Standard version offers 12 virtual instruments and 27 effects, the Studio edition features 19 virtual instruments, 51 effects and 2 ProChannel modules and the Producer edition includes 23 instruments, 57 effects and 8 ProChannel modules. Upgrades to SONAR X3 Producer are available starting from $149, $99 for the SONAR X3 Studio and price is $49 for the standard version upgrade. Prices depend on your current version, connect to your user account on Cakewalk to know the price of your upgrade. New users will pay $99 for the Standard version, $199 for the Studio edition and $499 for the Producer edition. Full details are available at www.cakewalk.com. Detunized releases ProdMod Live Pack ProdMod is a new Ableton instrument library with sounds derived from a customized Moog Prodigy. Cakewalk Sonar X3 Producer announced A US online store leaked the first details of the X3 Producer version of SONAR, an information that was later confirmed on the Cakewalk forum.